Wiltshire or the County of Wilts is situated in the south west of England and borders the counties of Dorset, Somerset, Hampshire, Gloucestershire, Oxfordshire and Berkshire. Along with the rest of South West England, Wiltshire has a temperature climate which is generally wetter and milder than the rest of the country. Wiltshire, mostly rural, is made up of high chalk downlands, limestone downlands, wide clay valleys and dales providing a beautiful rolling landscape. There are two rivers named Avon that flow through Wiltshire the Bristol Avon and the Hampshire Avon. The largest vale is the Avon Vale with the Bristol Avon cutting diagonally through the north of the county, flowing through Bradford-on-Avon and into Bath and Bristol. The Hampshire Avon rises at Pewsey in Wiltshire flows through the City of Salisbury and the county of Hampshire before entering the English Channel in Dorset. The Vale of Pewsey cuts through the chalk into Greensand and Oxford Clay in the centre of the county. The Vale of Wardour is in the south west of the county and to the south east are the sandy soils of the northern most area of the New Forest. The highest point in the county is the Tan Hill-Milk Hill ridge at 295 m (968ft) in the Pewsey Vale just north of Salisbury Plain. Wiltshire is known for its pre-Roman archaeology and the Mesolithic, Neolithic and Bronze Age people built settlements on the hills and downland. Stonehenge and Avebury are the most famous Neolithic sites in the UK. The largest area of chalk is Salisbury Plain a semi-wilderness used mainly for arable agriculture and by the British Army as training ranges. The famous Stonehenge, Avebury stone circles and other ancient landmarks can be found on Salisbury Plain. Wiltshire has many country houses open to the public including Longleat near Warminster and the National Trust’s Stourhead near Mere and the City of Salisbury is known for its mediaeval cathedral. Avebury is a village in Wiltshire about 5.5 miles west of Marlborough. Most of the village is encircled by the prehistoric Avebury Stone Circle. The village pub, The Red Lion, is a Grade II listed farmhouse from the late 16th century and claims to be the only pub in the world to be enclosed by a stone circle. It was built around the 86 foot deep village well which has been covered over with glass and features a dinning table. There are other prehistoric sites nearby such as West Kennet Long Barrow and West Kennet Avenue. Avebury is a World Heritage Site due to its outstanding Neolithic and Bronze Age landscape. The stone circles and henge monument are particularly unusual not just for its size but also for the fact that it is the only stone circle with a village within it. Avebury Stone Circle and henge is vast and consists of several smaller sites of varying dates. It was built and altered over many centuries from about 2850 BC until about 2200 BC and is one of the largest and most complex of Britain’s surviving Neolithic henge monuments. The henge consists of a huge bank and ditch about 1.3 km in circumference. The stone circle which lies within it is the largest in the world and contains within it two smaller inner circles. The stones are of a local sarsen stone and are managed by The National Trust on behalf of English Heritage and the two organisations share the cost of managing and maintaining the site and property. The stone circle has been used several times as a filming location. It was used in the short film ‘Lucifer Rising and for the 1998 film ‘Still Crazy’. Avebury was the setting for the 1977 cult television series ‘Children of the Stones’ that depicts Avebury, renamed Millbury, as a town controlled by the stones and also in 1977 it was the location for the BBC’s ‘A Ghost Story for Christmas episode ‘Stigma’. In 2002 the stones and the Red Lion were the subject of an episode of ‘Most Haunted’ and Avebury is the setting for Robert Goddard’s 2005 fictional thriller ‘Sight Unseen’. Avebury Stone Circle and the Henge are free to enter and wander around. Avebury Manor and Garden is a National Trust property. The early 16th century Manor House is a Grade I listed building situated in the centre of Avebury next to St James’s Church and close the Neolithic henge monument. The manor house was built on the site of a Benedictine alien priory of St Georges de Boscherville, founded in 1114. Avebury priory was dissolved in 1411 and its property granted to Fotheringhay College who held the manor of Avebury until the Dissolution of the Monasteries in the 16th century. The house has had many extensions and changes over the centuries. The house was leased and restored by Alexander Keiller who took a great interest in Avebury henge in the late 1930’s. The garden was redesigned in the early 20th century. The manor house which is reputedly haunted is privately occupied, but part is open to the general public and visitors are encouraged to touch and experience the furnishings and objects in the rooms which now represent periods in the house from the 16th century to the early 20th century. In 2011 Avebury Manor was the subject of the BBC One television series ‘The Manor Reborn’ in which was refurbished by a group of experts in collaboration with the National Trust. The Alexander Keiller Museum was opened in 1938 by Alexander Keiller and is now divided into two separate galleries; the Stables Gallery which has one of the most important prehistoric archaeological collections in Britain including many artefacts from the World Heritage Site monuments and the Barn Gallery which has interactive displays and a children’s area. The Barn Gallery a 17th century threshing barn tells the story of the World Heritage Site, its monuments and the people associated with it. The children’s activity area is designed to bring the archaeology and landscape of Avebury to life. They can dress up in Bronze Age clothes, make an archaeological rubbing, enjoy some fun games and colouring in. The museum that sits within the Avebury World Heritage Site is in the freehold ownership of the National Trust and in English Heritage guardianship on behalf of the Secretary of State for the Department of Culture, Media and Sport, the museum collection is on loan from the DCMS. The admission fees include access to both the Stables and Barn Galleries. Silbury Hill is a prehistoric artificial chalk mound near Avebury in Wiltshire. It is part of the Stonehenge, Avebury and Associated Sites UNESCO World Heritage Site. Silbury Hill at 39.3m (129ft) is the tallest prehistoric man-made mound in Europe and one of the largest in the world. The hill made from mainly chalk and clay excavated from the surrounding area stands 40m (132ft) high and covers about 5 acres. Its summit is flat topped and 30 metres (98ft) in diameter. Built in several stages between 2400 BC and 2300 BC the hills original purpose is not known. In March 2007 English Heritage announced that a Roman village the size of 24 football pitches had been found at the foot of Silbury Hill containing regularly laid out streets and houses. West Kennet Long Barrow is a Neolithic tomb or barrow situated on a prominent chalk ridge, near Silbury Hill, 1.5 miles south of Avebury. It is a chambered long barrow and one of Severn-Cotswold tombs. It has two pairs of opposing transept chambers and a single terminal chamber used for burial. At 100m it is one of the longest barrows in Britain and the stone burial chambers are located at the end. The entrance consists of a concave forecourt with a facade made from large slabs of sarsen stones which were placed to seal entry. The West Kennet Long Barrow commenced about 3600 BC, which is some 400 years before the first stage of Stonehenge, and was in use until around 2500 BC. Archaeological excavations in 1859 and 1955-56 found at least 46 burials ranging from babies to the elderly. It is said that this tomb was in use for as long as 1,000 years and at the end of this period the passage and chamber were filled to the roof by the Beaker people with earth and stones, among which were found pieces of Grooved ware, Peterborough ware and Beaker pottery, charcoal, bone tools and beads. These finds suggested that it had been collected from a nearby mortuary enclosure showing that the site had been used for ritual activity long after it was used for burial. The finds are displayed at the Wiltshire Museum in Devizes along with some very impressive beakers from Britain. The Sanctuary, situated by the A4, is one of the most enigmatic archaeological sites in the Avebury World Heritage Site landscape. The Sanctuary about 4500 years old is a complex of concentric timber and stone settings now represented by concrete posts. 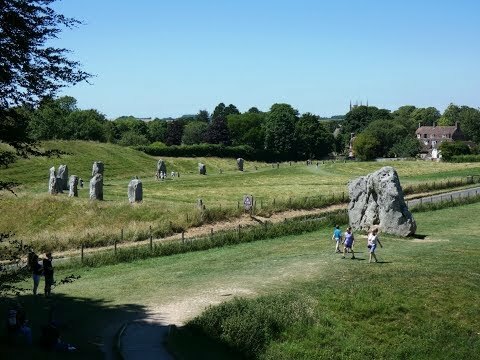 The connection of the Sanctuary to Avebury Henge via the West Kennet Avenue reveals its importance in the Neolithic period and beyond. The West Kennet Avenue is an avenue of originally 100 pairs of prehistoric stones raised to form a winding 1.5 mile ritual link between the pre-existing monuments of Avebury and The Sanctuary. From the car park we head to the main road and turn right for a short way then turn left at the footpath sign. We head forward to go through double gates passing Silbury Hill on our right. At the main road we cross straight over. We cross over a stream following the track then just after the track turns left we turn right on the distinct grass path uphill to West Kennett Long Barrow. After a look at the Long Barrow we retrace back downhill to the track and turn right. When we come to a tarmac track we cross straight over following the footpath sign. We head forward through the field keeping the hedge on our right. At the end of the field we bear right through the hedge and the trees and head forward to a track. We now turn left then at the road we turn left go over a road bridge and turn immediate right. We follow the grass path with the trees on our right until we come to a track. We turn left slightly uphill until we come to the main road. We go through the gate on the left to have a look at The Sanctuary before crossing straight over onto the track (The Ridgeway) opposite. We follow the track slightly uphill then at the brow we turn left at the footpath sign towards the trees. We keep following the track, The Avenue of stones can be seen down below in the distance. When we come to a minor road with a farm on our left we turn left. When we reach the houses of Avebury we turn left through the gate. We now follow the ridge and just before the road we turn right down the steps and head forwards between the stones to the Red Lion. We turn left along the little road to have a look at the museum, manor house and cafes in the village of Avebury before making our way back to the car park. This is an easy to moderate walk on grass and gravel public footpaths, tracks and bridleways. Approx 5.75 miles allow 3 hours using OS Explorer Map 157, Marlborough and Savernake Forest. This walk is done anti-clockwise. Start point: Avebury, National Trust pay and display car park. The charge is £7 for all day. Avebury Stone Circle, World Heritage site, is in Wiltshire. Entry is free. From the M4 take junction 15 onto the A346 to Marlborough. At Marlborough take the A4 west bound on the Chippenham, Bath road. Then take the right turn to Avebury situated on the A4361. Continue through the village of Avebury and the car park is on the right. Parking: Avebury, National Trust pay and display car park. There is no public toilets en-route but there are toilets with disable facilities near the Alexander Keiller Museum. For refreshments there is the Red Lion pub, Circles Cafe, Avebury Manor Tea-room, the Coach House Cafe and a small shop and ice-cream parlour. There is also a National Trust shop for those little gifts and mementoes.